A long time ago (but not in a galaxy far, far away) I outgrew the “Star Wars” fictional universe. And that’s probably why I’m able to like Solo: a Star Wars Story (2018), the “origin story” of Han Solo, in spite of it not featuring the “real” Han Solo and not feeling like a real “Star Wars” movie. Because I’m no longer mired in the movies’ mythology, I’m able to judge Solo as an independent work of space opera cinema rather than as a sacred scroll of “Star Wars” scripture. And I see that it is good—not very good, not even pretty good, but solidly good. I discovered that I’d outgrown the “Star Wars” fictional universe when I saw the “Special Edition” re-releases way back in 1997. (Has it really been 21 years?) In addition to being dismayed by George Lucas’s abjectly asinine decision to have Greedo shoot first (Han was legally justified!) and wincing at the glaring incongruity between the tacked-on CGI and the original (albeit cleaned-up) visuals, I was surprised that the magic had gone away for me. Star Wars (1977), now known as Star Wars: Episode IV – A New Hope, had become to me what it was to almost everyone associated with it before its theatrical release: “a silly space movie”; and the other episodes didn’t fare much better. I no longer liked the “Star Wars” movies themselves but instead only certain things in and about them. In fact, the only two things in the original movie that really held up for me were the characters of Darth Vader and Han Solo, and for me Solo had become semi-obnoxious in The Empire Strikes Back (1980) and completely obnoxious in Return of the Jedi (1983). But in the original Star Wars he’s super-cool, as cool as Sean Connery’s James Bond and Clint Eastwood’s “Man with No Name” and “Dirty Harry” Callahan. He’s not yet the “Ham Yoyo” Harrison Ford described as “dumb as a stump,” wanted to have killed in Return of the Jedi, and did have killed in The Force Awakens (2015). The original movie’s Han Solo is tough, sarcastic, cynical, selfish, arrogant, and independent—but in a good way, a Humphrey Bogart or Jack Nicholson sort of way. Hard times, not a hard heart, made him a rogue. 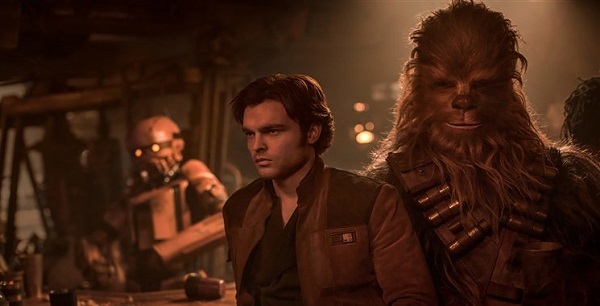 Solo is about those hard times: his time as a Corellian street urchin, his time in the Imperial military, and his time with a crew of spacefaring thieves. And because Han Solo is an iconic character originally played by an iconic actor, the casting and acting of him as a 19-to-22-year-old was a catch-22. A Harrison Ford-as-Han Solo impersonation would’ve been as risibly “uncanny valley” as an Elvis impersonation, but the performance wouldn’t be accepted without the basic physiognomy and mannerisms and essence of Harrison Ford’s Han Solo. But although Ehrenreich’s Han Solo isn’t a young reincarnation of Harrison Ford’s (as Donald Glover’s Lando Calrissian is of Billy Dee Williams’s), he’s likeable and a solid protagonist. Emilia Clarke is also likeable as Han’s self-reliant childhood girlfriend, while Paul Bettany is naturalistically chilling and sinister as her boss in the Crimson Dawn crime syndicate. And Woody Harrelson is just fine and Jon Favreau charms as analogs to Michael Rooker’s Yondu and Bradley Cooper’s Rocket Raccoon, respectively, in the “Guardians of the Galaxy” movies. Hey, those movies obviously borrow from the “Star Wars” movies, so it’s only fair that they borrow back! In fact, Solo is like a “Guardians of the Galaxy” movie sans the saccharine smarminess and silliness. To be sure, it’s visually murky, a little slow-paced, and too restrained; but it has a good, solid emotional core and fulfills its obligations to the “Star Wars” mythology without treating it with sanctimonious reverence. It’s a good movie that could’ve been a very or even really good movie with a young Dennis Quaid as Han Solo, a little more fun, and a lot more edginess. Solo is like a “Guardians of the Galaxy” movie sans the saccharine smarminess and silliness. [I]t has a good, solid emotional core and fulfills its obligations to the “Star Wars” mythology without treating it with sanctimonious reverence. 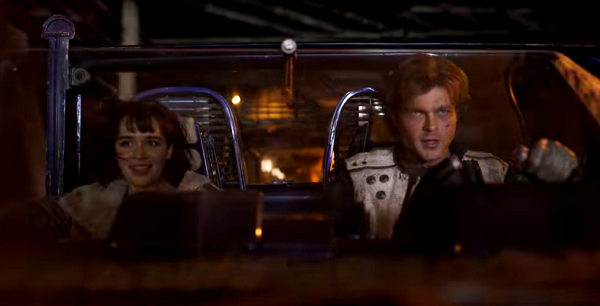 It’s a good movie that could’ve been a very or even really good movie with a young Dennis Quaid as Han Solo, a little more fun, and a lot more edginess. Jim Wallace is a prematurely retired Web designer/developer who’s beginning a second (part-time) career as a writer/graphic novelist/cartoonist. He has ideas for over two dozen projects and has been developing them—sometimes in dribs and drabs and sometimes in spurts—since 2016.